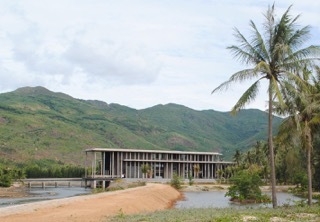 The International Center for Interdisciplinary Science and Education is a science and education institution located in the coastal city of Quy Nhon, Vietnam. It welcomes national and international conferences, specialized professional colloquia, as well as selected thematic schools, in particular for doctoral students. It includes a 350 seat auditorium, a conference room and seminar rooms along with offices for study and research with spectacular views out over the sea and nearby mountains.